There are many ways to provide shade and cover for your deck or patio. 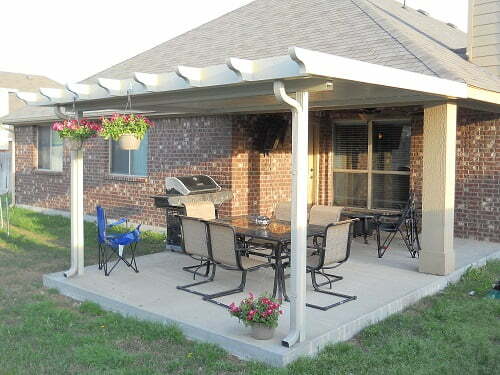 Two of the most popular are patio covers and retractable awnings. While both have their advantages, patio covers are almost always the better choice for your home. Find out why a permanent patio cover is the best way to create shade and protection for your patio, deck, or outdoor space. Retractable awnings are often billed as simple, flexible, and easy-to-use additions to your home. But in truth, they have several drawbacks and disadvantages when it comes to being effective covers for your outdoor spaces. The biggest drawback of retractable awnings is that they aren’t made to be permanent structures. Because the main cover of the awning is made from fabric, it is vulnerable to strong winds, falling debris, hail, and heavy storms. Most awnings only provide limited protection from rain, and over time the fabric can stretch and sag, causing water to pool in the low spots. Awnings are also faded and degraded by sun exposure – the fabric will become more brittle over time, leading to tears and fraying. Finally, they are almost unusable when it is windy outside. The fabric will catch any wind and potentially damage the awning or the wall it is attached to. In contrast, permanent patio covers can easily stand up to heavy winds and other weather. Patio covers are generally made with vinyl supports and an aluminum roof. This gives your patio a durable cover that works in any weather. They are also securely anchored and able to stand up to high winds without damage. Another drawback of awnings is that they need to be hung on a surface that can hold them securely. The wall you use for your awning needs to be at least as wide as the awning itself and strong enough to hold the structure. This can limit your options for where and how you place an awning or how big it can be. It’s also important to remember that awnings are attached directly to the structure of your house. If they aren’t installed properly they could lead to leaks, mold, or structural damage. On the other hand, patio covers can be built in virtually any style and size. It is possible to build patio covers that are free-standing and fully self-supporting, which means you don’t need to worry about connecting them to your home if you don’t want to. They can even be built in custom shapes to cover your entire deck or patio, rather than just a rectangular portion of it. Finally, awnings simply aren’t as durable and reliable as patio covers. Fabric is convenient, but it isn’t able to stand up to years of sun, wind, and rain. Over time a fabric awning will fade, rip, fray, and leak. The question is simply how long it will take. Awnings also require regular maintenance and care to prolong their lifespan. They need to be put up and taken down before and after use. Any hinges, joints, and bearings will need to be greased to ensure they work smoothly. And if your awning gets dirty you will need to remove it completely and scrub it down. Patio covers, on the other hand, are almost entirely maintenance free. They don’t require any special care, and are durable enough to last a lifetime. The vinyl posts and supports won’t fade or chalk, and the aluminum roof will never rust or decay. This makes a permanent patio cover not just the stronger solution but the easier one as well. If you want to learn more about our patio covers and the benefits they have for your home, contact us today at Future Outdoors. We’ve installed thousands of vinyl shade structures in and around the Dallas-Fort Worth metro, and we can help you find exactly what you’re looking for. Call (972) 576-1600 today to learn more or visit our Facebook page to see tips, ideas, and reviews from some of our satisfied customers.